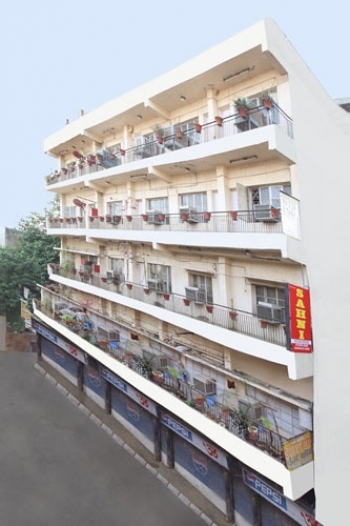 Hotel Sahni is a well budget hotel located in the heart of holy city, Haridwar. With comfortable accommodation, Hotel Sahni offers special facilities for leisure travellers. It is a hotel of Sahni group, known for providing excellent service to its guests since 2 decades. Hotel Sahni in Haridwar is only at a walking distance of 10 minutes from Haridwar Junction Railway Station and Haridwar Bus Stand. You can enjoy a comfortable stay at the hotel with Air conditioned rooms in summers and heated rooms in winters. The hotel has arrangements to provide delicious meals to its guests that are made available on special orders. Intresting places to visit in Haridwar such as Mansa Devi temple, Chandi devi temple, Har ki Pauri, Raja Ji National Park, Chilla Dam etc. are located in promiximity to the hotel. You can also plan excursions to places like Rishikesh (19 Kms) and Mussoorie (82 Kms). Dehradun is only at a distance of 53 Kms from Haridwar. The hotel is located at Sarvan Nath nagar in Haridwar, at a distance of approximately 750 meters from Haridwar Junction Railway Station. The hotel offers 48 well appointed AC/Non AC rooms and Suits with modern amenities like AC, Cable TV, Telephone etc. Delicious meals are made available in the hotel for the guests on special order. The hotel offers Catering on Terrace service, so guests can organize small partice at open terrace as the hotel provides proper arrangements for that. - AC rooms, Colour TV with cable connection, Telephone, Attached bathrooms with running hot/cold water. - Refrigerator, Laundry Service, Spacious Car Parking, Airport Transfer Facility, Travel Assistance. The Hotel offers catering on Terrace service, where guests can organize functions like small/kitty parties, birthday parties, get togethers etc. By Air: Nearest domestic airport to reach Haridwar is Jolly Grant Airport in Dehradun at a distance of 35 Kms. Daily flights are available for Dehradun from Delhi. Rest 35 Kms journey can be covered by taking a Taxi which is easily available. Nearest International Airport is IGI Delhi. Tourists from other countries can board a flight to IGI Delhi from their country and then a flight to Jolly Grant Dehradun. By Train: Haridwar is an important Railway Station of Indian Railways Network. You can board trains to Haridwar from different part of country. Shatabdi Express, Janshatabdi Express or New Delhi-Dehradun AC Express are some excellet options from New Delhi. Sangam Express from Allahabad, Hemkunt Express from Jammu, Upasana Express from Howra, Amritsar Express from Amritsar, Bandra Express from Mumbai are some other options. By Road: Haridwar is connected to Delhi through National Highway 58. Direct Buses to Haridwar is available from Delhi and many important destination in Northern India. The journey by bus takes around 4 hours from Delhi. Buses to Haridwar are also available from Gangotri, Haldwani, Jammu, Jaipur etc. Taxiâ€™s can also be booked to reach Haridwar by road.